Locally owned and operated. We have experience and passion for what we do, and take private in home care to a higher standard. Since this is a very personal service, we take the time to get to know you and your family; earn your trust and provide a truly customer focused home care experience that is tailored to your aging parents lifestyle. We care about what we do and it shows with every interaction with you and your family. We have processes that hold us to a higher standard of care. We don’t make these processes up as we go, they are based on decades of experience and are managed and overseen by a dedicated owner, who is involved at every stage of the process, who better to hold accountable then the owner? Proven processes and systems with a hands approach by the owner at the key stages of the process, to ensure a higher standard of care for your family. We spend the time right from the first phone call with you to learn as much as possible about the care requirements of your family member, then arrange a time to conduct a no charge in home consultation with you and the family member involved. A tailored care plan is created during the in home consultation based on what is important to you and your family. During this consultation, a great deal of time is spent finding out about likes, dislikes, and personality of your mom and dad or spouse, in order to choose a caregiver that is best suited to them. Specific care requirements are of course important but, personality and fit is what matters. The care of your loved one is supported by our Licensed Practical Nurse. Shortly after the consultation, usually within 24 hours but in some cases same day, we meet back up with you and your loved one for introductions of the caregiver we have selected for you, to give you and your mom and dad and the caregiver a chance to get to know one another and make sure the fit is perfect. You have final say on the caregiver we bring into your home. We don’t just talk about quality, we make sure of it. 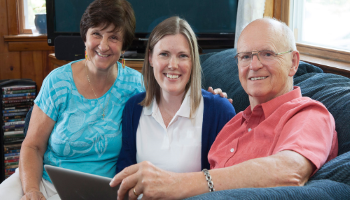 As the owner, I take the time to perform regular in-home visits to ensure your spouse, mom or dad are pleased with the work the caregiver is providing, and that the agreed upon care plan is being handled as promised. Our objective is to keep the same caregiver with your mom and dad to develop a trusting relationship and continuity of care. However, we always have a backup. All of our caregivers are qualified and educated, meaning they are certified, experienced and hand-picked by us, police background checks, credential verification, and references are thoroughly vetted. All of our care staff is bonded, and workman compensation covered. Our agency is licensed to operate in the province of Alberta and carries professional liability insurance. We are locally owned and based in Calgary, and you can reach us 24 hours a day, 7 days a week including holidays. We do not use a central call centre and if we miss your call for some reason, we respond to calls in 15 minutes or less! We are committed to continuing education of our staff to help keep them current and up to date on techniques and care treatments. Open and transparent communication, we provide you and your family with regular care updates, and access to our Family Room portal, for family members wishing to know how things are going in real time or for those living out of town that wish to participate in their family members care. We have a dedicated Licensed Practical Nurse (LPN) on staff to oversee every aspect of your mom and dad’s care plan, and available when needed for questions that might come up as care needs change. YOU get the owner of the business, who better to hold accountable for the service?! Why all this information is important to you, and why you should care? Your trusting us with the responsibility of care for your mom and dad, you should feel comfortable and have peace of mind knowing that the company you choose is properly structured to operate as a private home care provider, has processes and systems in place to minimize risk and provide the best possible care. You should care that the provider you choose will work to your schedule, will arrive at the time you desire, and that the same caregiver will be on the job to build trust and establish a routine that works best for you, your aging parent or spouse. Aging at home with dignity and maintaining a quality of life for your family member should be the priority. With Senior Homecare by Angels, you’re in charge of everything. We won’t be dictating to you what your schedule is to be (I.e. what time to get up, when to bathe, or meal schedule) It is our job to adjust to your schedule and to see to it that you remain comfortable in your home. Senior Homecare by Angels is senior care at its best! Senior Homecare by Angels is bonded and insured. We are licensed to operate in the province of Alberta. This can give you added peace of mind that a trustworthy caregiver will be in your loved one’s home. At Senior Homecare by Angels we know what it takes to deliver quality home care, and we are trained to continuously monitor the caregivers through our unique system of continued personalized contacts, not only with the caregiver but also with the family. Through telephone check-in and home visits, our system is designed to enable us to check in regularly with your loved one. We want our elderly care recipients to receive the best possible care. No two people are alike. Therefore their elderly needs are very different. Whether you need respite care, in-home care, part-time or full time care, or care at an assisted living facility, Senior Homecare by Angels can offer a skilled caregiver that is right for you. We tailor our senior home care based care plan on your needs. Your care plan is flexible and you can change the program as different needs arise. We will work along with any home health agency or nursing agency that may be assisting your loved ones after a hospital stay. In fact we compliment the medical care, as we focus on the non-medical care services factor of recovery. Private In-Home care can be a very affordable option for families as compared to many retirement homes. Early on many seniors only need a little bit of help in the home in order to remain independent. Isolation can also be a concern as a senior’s circle of friends may not be as large as it once was and as busy families live further apart. As well, it is a benefit for a senior who may still see their family on a regular basis to have interaction with a third party, someone who doesn’t know or hasn’t heard all their stories, someone who will bring a fresh perspective, a new conversation. Private Elder Care Solutions That Work For You.